This Rice Stuffing is one my mom makes for Thanksgiving and occasionally other times in the year. 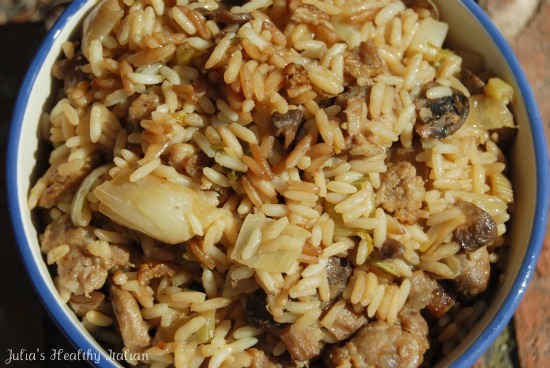 Its a mix of Rice, Sausage, Turkey, Mushrooms, Celery and Onions that'll put a smile on your face! It's a healthy complete meal all in one bowl in the time it takes to cook the rice. Our Sunday dinner brings 21 of us to the dinner table. Nonna Battaglia, my mom, has to make quite a bit of food every Sunday to feed that many of her kids and grandkids. People often are surprised that we get together every Sunday for dinner. For me, its normal. Its beautiful to be able to connect with your family around the dinner table like that. I have 2 siblings and between my brother, my sister and myself we have 13 children. Oh, the funny things you hear from this group of 1 to 16 year olds! All the kids play together both before and after dinner. My kids just love to see their cousins. My children are the youngest of the group. Their cousins are especially fun for them, being older than they are. We are the runaways. My husband and I live about 20 miles from my mothers house. My brother and sister both live a stones throw from my mothers house. My brother and his 5 kids are 5 houses away, while my sister and her clan live 4 blocks away. They are all happy as clams! Cook rice plus 1 small chicken bouillon in water according to directions, pour into casserole. Sauté onion and celery in 1/4 cup olive oil until golden, salt and pepper to taste, cook about 12 minutes. Sauté mushrooms in a separate pan, with no oil. Once they discard their water and are dry in the pan, add to celery and onion mix, mix well, toss in with rice. Sauté sausage and turkey chop in 2 tablespoons olive oil. When meats are browned and cooked through, add to rice, blend well. Add 1/4 cup soy sauce, mix well. This is my absolute favorite blog EVER! 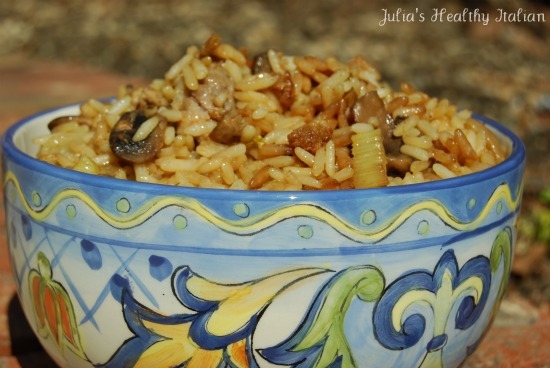 I stumbled across here yesterday and already made your freezer meals and am cooking another recipe for dinner tonight! I see so many of my favorite foods on here but healthier..so exciting!